Setting up custom scripts to run automatically has many uses, for example I use scripts for tasks including MySQL database backup and email and managing notifications from website portals. The steps below run through how to set a scheduled task to call a PHP script from your website. The ‘Path to executable file’ is where you enter the URL to the php script on your website, but as the direct path to the site on the server. On windows servers for example, this may look something like: C:inetpubvhostsyourwebsite.co.ukhttpdocsfolder1scriptname.phpIf you’re not sure of you’re path, you can run the php command echo $_SERVER['DOCUMENT_ROOT'] from your site to find out. The arguments field can be left black and task priority set to Normal. Finally set how frequently you wish the schedule to run. 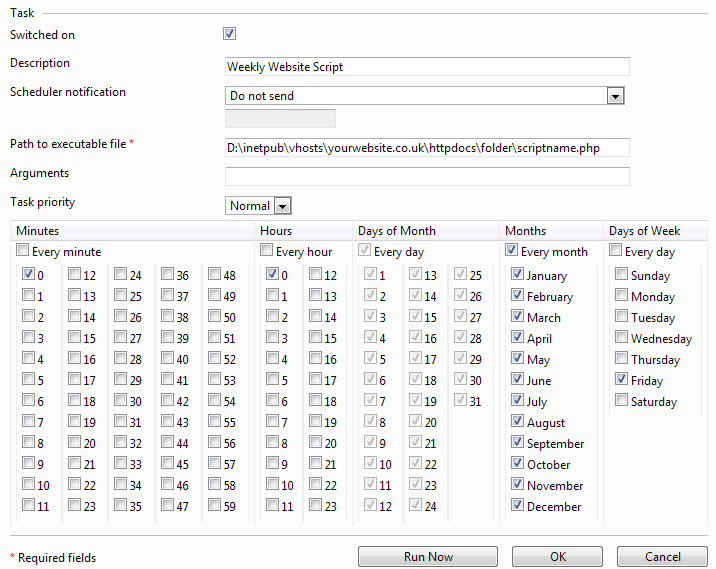 The below example screenshot will run the script at midnight, each Friday every month. That’s it! Click OK to confirm or Run Now to confirm and test. I have done same like above code. But email is not coming. Please help me to resolve it.